Chelsea’s Eden Hazard did little to douse speculation over a move to Real Madrid on Thursday, although the forward appeared to rule out a mid-season move. The 27-year-old, who has spoken of his daily quandary over his future, was speaking at a media conference on national team duty with Belgium. It was put to Hazard that to win the Ballon d’Or – as the world’s best player – he would have to play in Spain. “That’s why I want to go, maybe,” said Hazard, who was smiling. 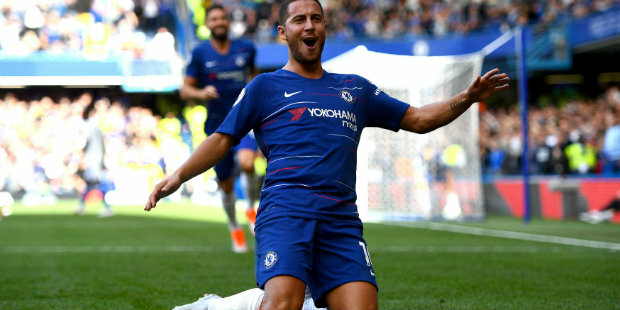 Hazard has been in sparkling form this season and was asked about persistent rumours of a switch to Real after last Sunday’s win at Southampton. Hazard, whose Chelsea contract runs until June 2020, said: “Real Madrid is the best club in the world. It is my dream since I was a kid. The Belgium playmaker is not short of confidence at present and asked on Thursday whether he was the world’s best player on form, his answer was unequivocal. Hazard has scored seven Premier League goals in eight starts, plus a sensational strike in the Carabao Cup third round win at Liverpool, to make a fine start to life under Blues head coach Maurizio Sarri. He joined Chelsea in June 2012 from Lille. His current contract, signed in February 2015, runs until the end of next season. Hazard acknowledges this next contract is crucial, so he is taking his time to consider whether to remain with Chelsea or move on. He was heavily linked with a move to the Bernabeu after helping Belgium to third place at the World Cup, but no switch materialised. Reports from Spain earlier this week suggested Real would try to prise Hazard from Chelsea in January, although such a move would come at a premium price. And it may be that Real would be prepared to wait until next summer, when Hazard will have just 12 months of his contract remaining, to make their move, knowing Chelsea would be reluctant to risk losing him for nothing the following year. One of the many potential obstacles to the deal would be if Antonio Conte moved to Real as head coach. Julen Lopetegui’s position is reportedly precarious and Conte has been linked as a potential successor. Hazard hinted at being frustrated with the Italian at times last season. 2 Comments on "Hazard continues to stoke speculation about his future"
I will miss Hazard a whole lot should he move on to Madrid. But I’m quite show my beloved Blues will keep him for good.